The Thames is one of the major avenues of transportation for visitors to the Olympics in London. This is nothing new, as Pissarro shows in this panorama of Charing Cross Bridge with the crowded ferry boats. 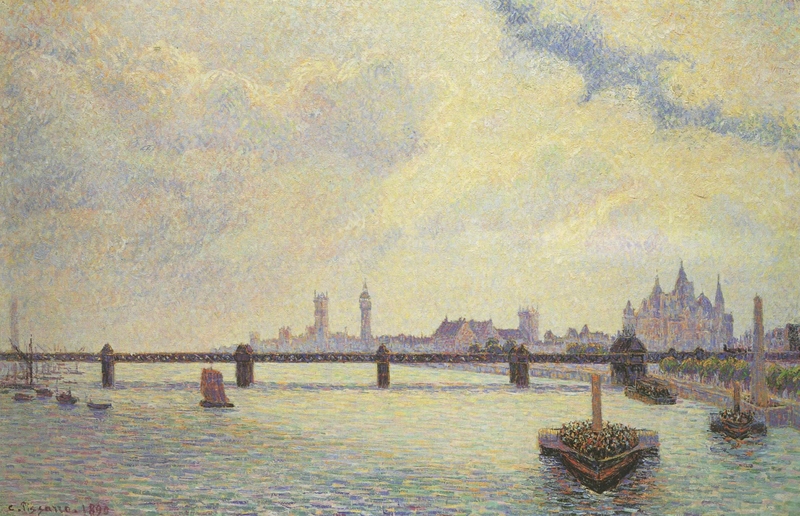 Pissarro emphasizes the expansiveness of the Charing Cross Bridge by choosing a canvas half again as wide as it is high. The bridge is just a narrow band through the center of the painting. Even though the Houses of Parliament, Westminster Abbey and other important buildings are in the background, they are subdued into pastel silhouettes. Even Cleopatra’s Needle on the right is subdued to anonymity. All the big boats are placed on the right side with one large passenger boat heading straight into view. On the left is one small sail boat with a string of tiny crafts disappearing into the canvas edge. The center of the canvas contains nothing more than a span of water reflecting the sky. In the background is the Clock Tower, known as “Big Ben” which was completed in 1859. Pissarro was concerned that well-known landmarks be correct, and as he was finishing this painting in his studio in Eragny, he wrote to his niece Esther Isaacson in London to confirm the exact placement of various details. The sky dominates more than half of the painting. What appear to be white puffy clouds are made up of pale pinks, blues, mauves in tiny comma-like strokes. The colors are the same ones seen on distant buildings. Only one sliver of blue sky is visible cutting across the right upper corner of the canvas. The river reflects the same colors, the pinks, blues and mauves, laid down in wavelets. The steam boat plowing through the water in the lower right foreground was powered by a steam-driven paddlewheeler, a model that had not been seen on the Seine at that time. The deck was loaded with passengers, who according to Pissarro created a “mass of dots that give these boats their characteristic appearance.” The following year in his studio, Pissarro painted another version of this scene on a less expansive canvas, moving all the boats closer to the center.